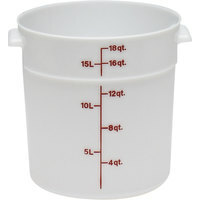 Food storage containers are essential to any commercial kitchen. They're available in a variety of colors and materials, and in an array of sizes in round, square, or rectangular shapes. With so many options to choose from, determining which types of containers are best for your establishment can get rather tricky. 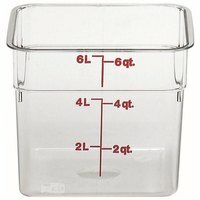 This guide will walk you through the basics of food storage containers, and guide you to the right containers for your unique needs. Thanks to their crystal-clear clarity and shatter-proof construction, polycarbonate food storage containers offer fast product identification and longevity in commercial kitchens. These containers can withstand temperatures from -40 degrees Fahrenheit to 210 degrees Fahrenheit, making them perfect for use with cold foods in refrigerators and freezers. Polycarbonate food storage containers are designed to resist food acids and oils to maintain their clarity even after extended use. Polypropylene food storage containers offer an economical option for cold food storage, while providing a 100% Bisphenol-A (BPA) free food contact surface. They feature a high chemical resistance and can withstand temperatures from -40 to 160 degrees Fahrenheit, making them also perfect for use with cold foods in refrigerators and freezers. 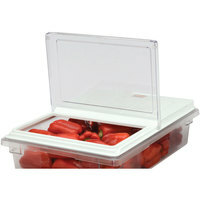 Polypropylene food storage containers offer a translucent appearance. Made from the most common type of plastic, polyethylene food storage containers are 100% Bisphenol-A (BPA) free and among the lowest priced containers on the market. They feature a white, impact, stain, and chemical resistant construction, and, like polypropylene containers, can withstand temperatures from -40 to 160 degrees Fahrenheit. 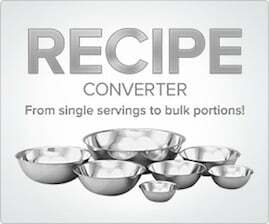 They are perfect for use with cold foods in refrigerators and freezers, or for dry food storage. Food storage containers come in one of two shapes – round or square, with each shape having its own set of benefits and limitations. While round food storage containers promote proper air circulation around the container and faster cooling times, square food storage containers maximize storage space. Further, while square food storage containers serve to hold more product in a smaller area of space, the rounded interiors of round food storage containers minimize food waste. What sizes you'll need will depend primarily on what you are using the products for. Wet ingredients, dry ingredients, fresh produce, sauces, soups, pickles, jams, the possibilities are endless in these containers! Lids ensure that the contents of your food storage containers remain fresh until ready to use. There are several types of lids to choose from. Cambro Seal Cover lids are tight fitting and spill resistant, with an inner and outer seal for superior protection. 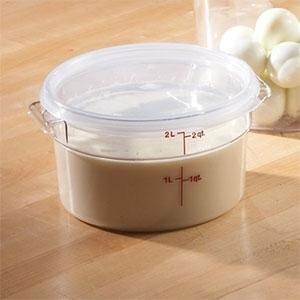 These particular lids are only compatible with select Cambro containers, but there are other lids available with this sealing design that enable you to tip the container completely upside-down without it leaking. If this type of protection is not quite what you are in need of, a less expensive, easy-on/easy-off snap-on version offers an airtight fit and great spill-resistance, but not the guarantee that if you tip the container over, no leakage will occur. For fast lid identification, some lids come in color-coded varieties, with one color per size. Again, these lids are not liquid tight, but do offer a snap-tight closure to keep foods fresh. 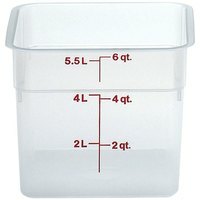 Food storage containers are not only great for storing food and liquid, but they are also great for providing approximate measurements, thanks to the graduations or measurements that are etched or printed onto the exteriors of many containers. These indicators allow your staff to see how much is in each container without having to measure out the contents. For space-saving storage, all of our food storage containers feature stackable designs. These types of containers easily nest when not in use, and when in use, their stacking lugs allow for safe, stable stacking with other containers of the same brand, or even with similar brands. Plastic drain trays slip into food storage boxes to allow liquids to drain to maintain optimum freshness. Food storage box lids come in white, clear, or color-coded colors, and serve to keep contaminants out of your food during storage. 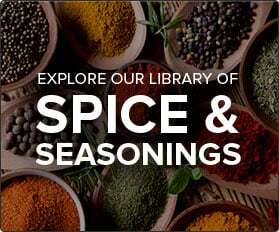 While they do not seal, they do offer a secure cover for your fresh ingredients. Food storage box lids are available in standard flat varieties, as well as sliding and flip top designs for your convenience. Both sliding and flip top lids allow your staff to only open one-half of the cover at a time, ensuring that the other half remains protected. 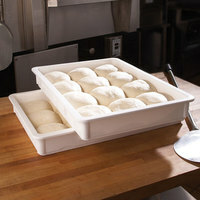 Great for proofing and storing pizza dough, pizza dough boxes prevent crusting to increase the storage life of dough. Available in polycarbonate or polypropylene varieties, and sized at 18" x 26", these boxes are often used with their compatible covers and then stacked with additional boxes for space-saving proofing and storage. Dollies are also available to make transport a breeze when multiple boxes are stacked. Like food storage containers and boxes, ingredient bins are designed to keep all of your most frequently used dry ingredients organized and fresh. They come in a range of sizes and are available in square, round, and rectangle shapes. All of our ingredient bins are made with heavy duty plastic for long-lasting use and come in countertop and floor models. 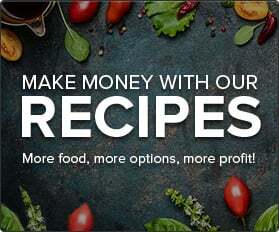 To find the right ingredient bin for you, consider the amount of bulk ingredients you need to store to keep your busy kitchen running smoothly. If you have a few ingredients that your kitchen utilizes on a daily basis, choose a multiple compartment ingredient bin. Each ingredient bin comes with its own lid and the type of lid can vary between bin styles. Some have a clear lid for ingredient visibility and others have a solid colored lid to conceal ingredients from view. Both lid types help to keep your ingredients from being tainted by airborne contaminates. They are also great for stacking purposes. If your lid becomes damaged after extended use, we have replacement lids for most ingredient bins styles. Most floor model ingredient bins include casters for easy mobility. They allow kitchen employees to maneuver the bins to different work areas and slide them under work surfaces, which is especially helpful in small kitchens or tight areas. If a caster becomes damaged, we carry replacement casters. 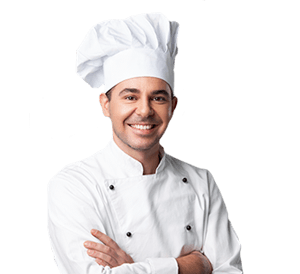 NSF International – In the food service industry, NSF International's primary function is to create sanitation safety standards for testing products. 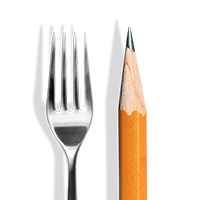 NSF also uses these testing standards to approve anything from large restaurant equipment to small manual prep tools for safe use in food service operations. In most instances, restaurants will be required to have NSF Listed equipment and supplies to pass health inspections. NSF Certifications are noted on every product that meets these industry standards. Look for this symbol when you shop! So, you’re looking for a walk-in cooler or a walk-in freezer . You have the space, you have the financing, and you need the extra refrigerated storage as soon as possible. What now? We’re here to give you a crash course in walk-ins so that you can make an educated decision about which of the many options is right for you! Creating and maintaining an effective storage area in your business can be challenging, especially if you have limited space and lots to store, but purchasing a shelving unit can take your storage capacity to new heights. 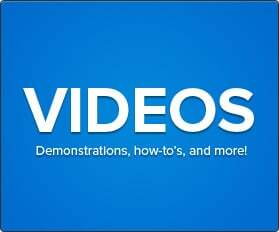 Unfortunately (and fortunately), there are all kinds of shelves, materials, components, and accessories to choose from when looking into buying a shelving unit. This guide will explain all things shelving-related and inform you on how to pick the perfect shelving unit for your commercial kitchen!